See full item description and all pics. 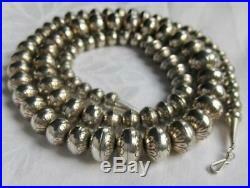 Vintage NAVAJO STERLING SILVER 30 Stamped Bench Bead NECKLACE marked 87 beads. NOTE: White spots in pics are from light reflections, not on object. A fantastic older vintage hand made sterling silver Native American Navajo stamped bead necklace in a stunning 30 length. This necklace is great to wear, it looks and feels beautiful on. Beautifully made, it has a good weight so it lays nicely but doesn't feel cumbersome. 98.7g / 3.17ozt.. I've looked online at others this length and few weigh this much, I only found 1 that weighs more. Strung on a sterling chain, cone ends and a hook closure. The cones have a stamped mark, a half circle with many rays , like a sun, and stamped STERLING on both. Beautiful handworked beads, I'm not an expert but I think these are called bench beads. Basically 4 different sizes & large center bead. Total of 87 beads if I counted right. 5/8 across, smallest beads approx. All have a petal looking design stamp on top & bottom of bead. Next to smallest size bead has a ridged edge, all of the others have the smooth pearl like edge. Gorgeous silver light reflection quality. I have not polished it and leave that to new owner if desired. Beautiful condition with no obvious damage. I did not find any dents or damage to the beads. If I missed something it is very small. 98.7g or 3.17 troy oz. May become your go to necklace, totally flattering on. I send out an invoice within 24 hrs. Or less, otherwise Priority and Parcel are options. Most of my items are old or vintage & will show appropriate signs of age & use. Linens and clothing have not been laundered unless stated so, they may have age related odors. I leave feedback once the sale is complete, that is once you have received your item and have left feedback letting me know. Please recycle or reuse your box & packing materials, thanks. Get Supersized Images & Free Image Hosting. Create your brand with Auctiva's. Attention Sellers - Get Templates Image Hosting, Scheduling at Auctiva. The item "Vintage NAVAJO STERLING SILVER 30 Stamped Bench Bead NECKLACE marked 87 beads" is in sale since Saturday, August 4, 2018. This item is in the category "Jewelry & Watches\Ethnic, Regional & Tribal\Native American\Necklaces & Pendants". The seller is "redgleen2" and is located in Chicago, Illinois.